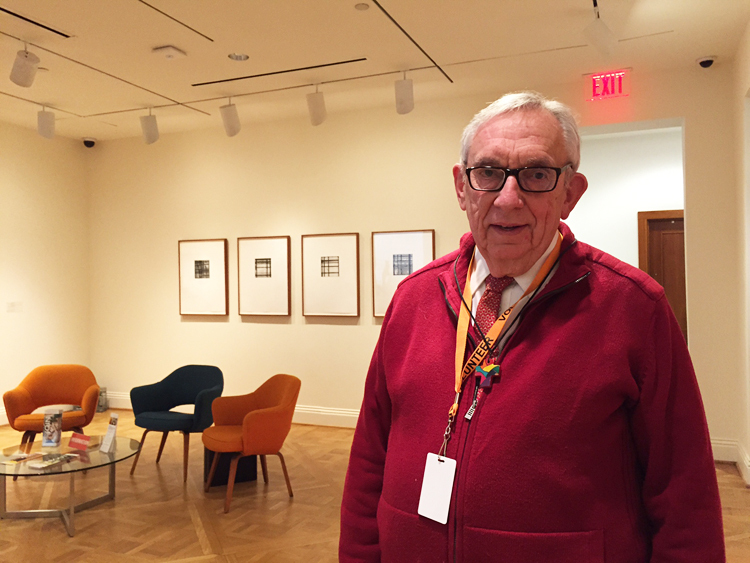 Gerry Hendershot is an Art Information Volunteer at The Phillips Collection. Here he shares his process and his poem inspired by Edward Hopper’s painting, Sunday. In February I attended a three-day poetry workshop near Atlantic City, NJ. Each morning, 100 student poets gathered to receive a one-sheet prompt, then were given two hours to draft a poem; in the afternoon, groups of ten student met for moderated discussions of each poem. On the day I wrote the below poem, the morning prompt directed us to write about something that was missing using stanzas of 2, 3, or 4 lines, and to include a piece of furniture, a spice, a proper name, and a musical instrument. We had to submit a hand-written fair copy of 30 lines by Noon. Because of my longtime love of art, I have acquired an interest in ekphrastic poems; that is, poems about art, such as W. H. Auden’s “Musée des Beaux Arts.” I recalled a poem by Victoria Chang, “Edward Hopper Study: Hotel Room,” which led me to think of Hopper’s painting Sunday. I had recently attended a Spotlight Talk on Sunday, where I heard other viewers comment on its unsettling psychological impact. Like other works by Hopper, it creates in me a feeling of imminent danger, of something tragically missing. With Chang’s exemplar as guide, and Sunday in my mind’s eye (aided by online images! ), it was not difficult to meet the other prompt requirements— proper name, furniture, spice, and a musical instrument. Feedback from fellow student poets led to revisions—which are continuing. leaving the other side dark. red and white candy striped pole. Is he missing the tools of his trade? full of brushes and scents, precursors of Boss and Old Spice? through windows of medieval glass? Gerry Hendershot is a retired CDC health statistician who has been volunteering at the Phillips for 12 years. He is a member of the nearby Church of the Pilgrims at 22nd and P Streets, NW, and co-founder, with his wife, of its Dupont-Pilgrims Art Gallery, an alternative art space for area artists. (Left) Edward Hopper, Sunday, 1926, Oil on canvas 29 x 34 in. ; 73.66 x 86.36 cm. Acquired 1926. Paintings, 0925, American. The Phillips Collection, Washington DC. (Right) Edward Hopper, Approaching a City, 1946, conte on paper, 15 1/16 c 22 1/8 in., Collection of Whitney Museum of American Art, New York; Bequest of Josephene N. Hopper, 70.869. To learn more about this painting on the anniversary of Edward Hopper’s birth, below is an oral history transcript from the Archives of American Art in which Hopper was asked about what gives this work its intense feeling. See the painting on view in the Made in the USA show through August 31. 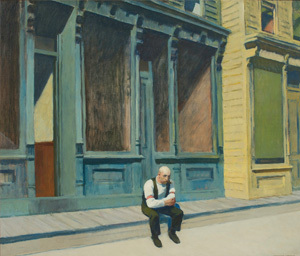 JOHN MORSE: Mr. Hopper, I’d like to ask you about one particular picture that made a great impression on me when I first saw it at the Whitney exhibition, and still does, although now it’s in the Duncan Phillips Collection in Washington. That’s Approaching a City, and I’m quite sure, or how I could put it into words, the particular appeal of this picture—maybe it’s impossible—but I would like to hear what you have to say about it. EDWARD HOPPER: Well, I’ve always been interested in approaching a big city in a train, and I can’t exactly describe the sensations, but they’re entirely human and perhaps have nothing to do with aesthetics. There is a certain fear and anxiety and a great visual interest in the things that one sees coming into a great city. I think that’s about all I can say about it. JOHN MORSE: Well, in painting this picture were you aware of these wonderful solid geometric forms that took my eye at once? EDWARD HOPPER: Well, I suppose I was. I tried for those things more or less unintentionally. JOHN MORSE: Would you go so far as to say it’s almost a subconscious result, effect? EDWARD HOPPER: Yes, I think so. JOHN MORSE: But what was in your mind when you were painting it, I gather then, was this feeling of approaching a city?